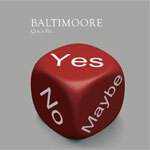 On the cover of Quick Fix, the 11th release, from Swedish outfit Baltimoore is a die-like cube with choices: yes, no or maybe. If these are the choices of recommendation to faithful readers, then the answer is a definite 'maybe.' If you like your melodic rock a bit more bluesy ala early Coverdale, your vocals predictably raw, throat meets rough grain sandpaper, and really dig old school Hammond organ, then Quick Fix might be right up your alley. This disc is really a turn for Baltimoore (which for our purposes is vocalist Bjorn Lodin), as a dual guitar dynamic is replaced with guitar and Hammond organ (Orjan Fernkvist). The latter influence is quite wide and deep throughout, and noticed immediately within I'm All About Me and Haze of Wonder. Mostly, the organ presence is masterful by inclusion and performance, but exceedingly overwhelms everything else. (Fernkvist is not to blame for this, but rather Lodin, as principal and composer.) Generally, the songs follow a blues enhanced melodic hard rock. When they favor this motif, as on I Am Who I Am When I Am Alone, Make Good (probably the best song), and possibly Tell Me What You Want To Be Today, the music better than average. The only other real star on Quick Fix is fervent and steady rhythm section. In the end, though interesting in parts, I remain ambivalent to Quick Fix. Quick Fix is truly a roll of the die as on its cover. The latest incarnation of Bjorn Lodin's Baltimoore is old school rock, rhythm and blues, thanks generally, to the arrangements but more specifically to the heavy use of Hammond organ. It's impressive and well played, but quite overwhelming throughout and left me ambivalent towards Quick Fix. If your ears are truly eager for some versatile blues-based rock, then check out the new UFO album, The Visitor. Quick Fix is truly a roll of the die as on its cover. The latest incarnation of Bjorn Lodin's Baltimoore is old school rock, rhythm and blues, thanks generally, to the arrangements but more specifically to the heavy use of Hammond organ. It's impressive and well played, but quite overwhelming throughout and left me ambivalent towards Quick Fix.